Literally Shinkansen means "New Trunk Line", and is referring to the tracks, but the name is widely used inside and outside Japan to refer to the trains themselves as well as the whole rail system. The developments of high speed rail travel in Japan led to the introduction of similar trains throughout the world..
Bullet Trains use tunnels and viaducts to go over and through obstacles rather than around them. With a minimum curve radius of 4,000 meters (2,500 meters in the oldest Tokaido Shinkansen), the system was built entirely from the ground up on elevated tracks without road crossings and separate from conventional rail. 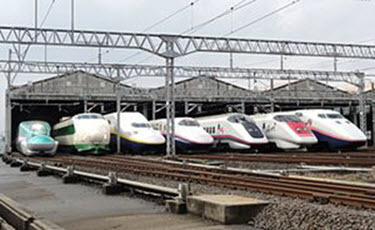 The Tokaido Shinkansen is the world's busiest rail line. Carrying 375,000 passengers a day, it has transported more passengers (4.5 billion) than all other high speed lines in the world combined. Mainly a long-distance transport system, the Bullet Train also serves commuters who travel to work in metropolitan areas from outlying cities. During 2012, the the UK's own version of the bullet train - known as the Javelin Train - was used to provide spectators with fast and efficient cross London rail travel to the main Olympic games sites. Currently the Javelin is being used to provide Southeastern Rail travellers with fast rail connections between London and the Southeast of England. Click here for details of the Javelin train timetable if you're looking for a fast trip into or out of London to any of the major towns in the southeast, or we also have a page dedicated to high speed javelin routes if you need to work out plans for a future journey. The Japanese Bullet Train, also known as the Shinkansen, presents one of the most iconic Japanese images. These trains - which recently celebrated their 50th Anniversary - run on a network of high speed rail links operated by different Japanese rail companies, with the networks linking most major cities in Japan at speeds of up to 300km/hour. A world record speed of 361mph was set in 2003. Riding the Shinkansen was one of my most enduring memories of a Japanese trip. It's hard to believe the first model was running in time for the 1964 Tokyo Olympics. At that time, it almost halved the time to get from Tokyo to Osaka.